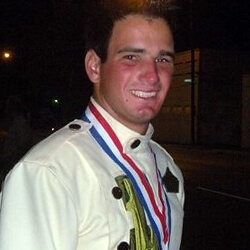 Preston Cheek, 19 Columbus State University Carolina Crown Brass, 2005-2009 How did you choose your corps? I picked Carolina Crown after seeing their 2004 show "Bohemia." My band director Jeremy Worley was a soloist with Carolina Crown in the 2000 show "The Mask of Zorro," so he pushed me to march there. The location of the corps also aided my decision because I am from the Southeastern United States, and Carolina Crown is nestled right there in Fort Mill, S.C. In your experience, what's the best way to prepare for an audition? The best way to prepare for an audition is to be as confident as possible with your materials. You have to know everything on the page like articulations, dynamics, phrasing, etc. Also move your feet in time with everything you do. It is imperative that you "play to your feet." What can a prospective corps member expect when he/she shows up for an audition weekend? There are going to be a lot of things going on and you're probably going to feel a bit overwhelmed. Don't sweat it, you can do this. Simply focus on what you already know how to do. Don't be afraid to talk to people, because chances are they are going to be friendly. The first time you auditioned, was the process different from what you expected it to be? Yes. I expected the staff members to call out all of my flaws throughout the whole camp weekend, but the staff was far more constructive than critical. Were you nervous at your audition? Yes, I was extremely nervous. I was 15 years old not even knowing what I was getting into. The trick to getting past your nerves it to take a deep breath and apply the techniques that you already know. What do you think is most important for someone to take away from the audition experience? Take and apply the techniques you learned outside of the audition camp. They will be very helpful to you in the future with your respective corps as well as with your ensembles outside of the corps. Any other advice? Keep coming to the auditions and rehearsals and improving from camp to camp. Your commitment to the organization and improvement between each camp shows a great deal about your attitude and work ethic. Your work ethic and attitude will be an important factor in the audition process. Learn more about corps audition dates, locations and additional info.